4-20 mA CollectionThere are 5 products. 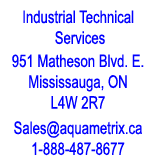 Aquameterix sensors from our product line that all have a common feature—direct 4-20 mA output. These sensors have transmitters built into them that are powered by, and output to, a PLC. Since they do not require an external transmitter they are very cost effective. In two cases (the dissolved oxygen sensor and ultrasonic level transducer) they can also output a digital Modbus signal. All of them can be powered by an inexpensive 24 VDC power source and read by a panel meter.